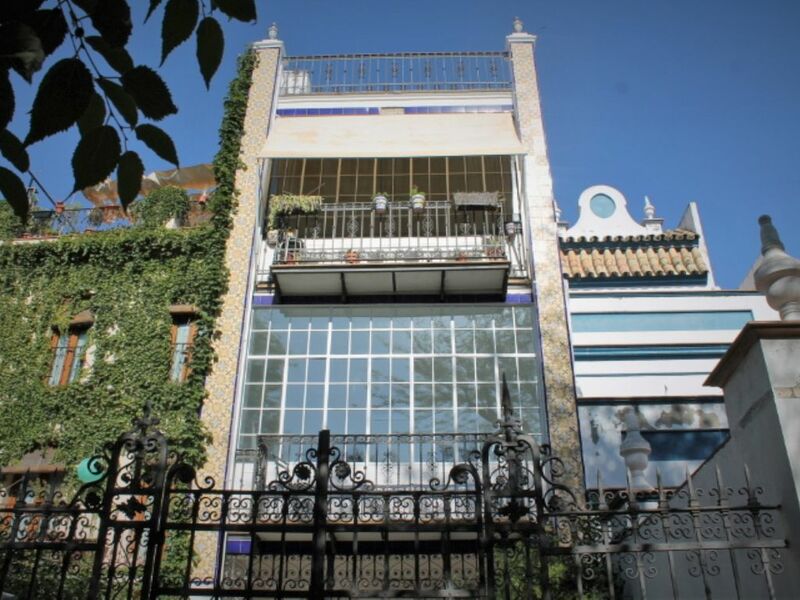 An individual apartment for max 3 persons on the second floor in a typical Sevillian house. Located in the old centre of the city on a big pedestrian square with many trees. Around the square there are typical tappa-bars, restaurants end shops. The apartment has one bedroom with a double bed , a extra bed in the living room and a bath room with shower. The living room has a open kitchen with everything you need. You can also visit the roof terrace with a beautiful view of the square. Supplied with washing machine, TV, radio and a computer with Internet access (WiFi). there are also extra bedsheets and towels available. Possibility of a 3ª person on a extra bed in the living room. Under 6 years free of charge. Un apartamento individual de 50 m2 para max 3 personas en la segunda planta de una casa típica sevillana. Situado en el casco antiguo de la ciudad en una plaza peatonal con muchos árboles. Alrededor de la plaza hay muchos bares de tapas típicas, restaurantes y tiendas. El apartamento tiene un dormitorio con una cama doble y un baño con ducha. El salón tiene una sofa cama para 2 personas extra. hay una cocina americana, equipada con lavadora. Puedes visitar la azotea para disfrutar una copa de vino con una hermosa vista de la plaza. El apartamento dispone aire acondicionado, televisión, radio y un ordenador con acceso a Internet (WiFi). todas las mas importantes sitios como La Catedral, la Giralda, el Alcazar y el toro del oro estan a poca distancia del apartamento. Esta en el espacio verde mas grande del centro de Sevilla la Plaza Alameda de Hércules donde ha mucho restaurantes y bares para tomar una tapa. Aquí salen la gente de Sevilla para pasear y tomar una copa en una de los veladores. A great place in beautiful Seville! The location of the apartment completely corresponds to the description on the site! It was very easy for us to find this place. The owner of the apartment, Walter, very quickly answered all our questions. We found free parking on the waterfront in 5-7 minutes walk from the apartment. We really enjoyed living in this apartment: the apartment is very quiet, despite the fact that the house is located on a very noisy square, the apartment has an interesting configuration around the small patio, to all sights not more than 10-15 minutes walk. We will recommend this apartment to our friends! El apartamento es soberbio y muy bien situado. Pasamos una semana muy bella. Los propietarios son calurosos. ¡ Recomendamos este alquiler! The apartment is completed and very well situated, in a modern, very pleasant and quiet district. The historic center is in some steps. The tenants are very warm. We recommend this rent! First choice in Sevilla ! Perfect situation in Sevilla. Clean apartment in a quiet environment . You are at a walking distance of the main attractions, restaurants and bars (tapas). The owner has a very helpful attitude. A perfect place for a short or longer stay. Parking can be found nearby. Un appartement agréable et surtout particulièrement bien situé au cœur de la ville. Sans voiture, nous étions à proximité de tout, et de jour comme de nuit, nous avons pu profiter de la douceur de vivre à Séville. Merci beaucoup pour votre visite à Séville. je l'espère vous revoir dans notre appartement. El parque temático isla mágica esta a 5 min. andando.